File photo: The Tucker City Council members.. Left to right: Councilors Pat Soltys, Matt Robbins, Michelle Penkava, Mayor Frank Auman, Bill Rosenfeld, Noelle Monferdini and Anne Lerner. Credit: Matt Holmes, City of Tucker. 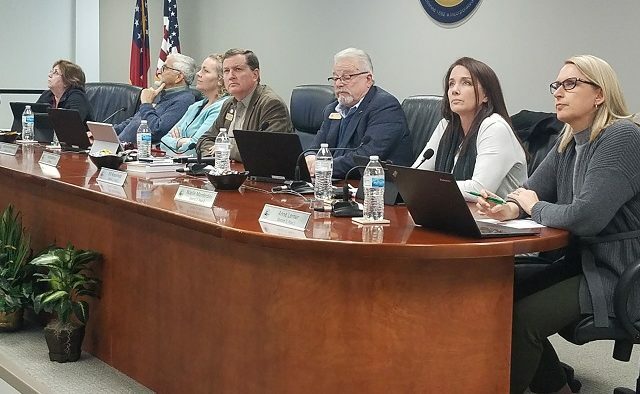 The Tucker City Council voted unanimously Monday night to extend its intergovernmental agreement (IGA) with the City of Clarkston to continue hosting its municipal court sessions, as well as adding a third session each month to the calendar to allow cases to be heard faster. 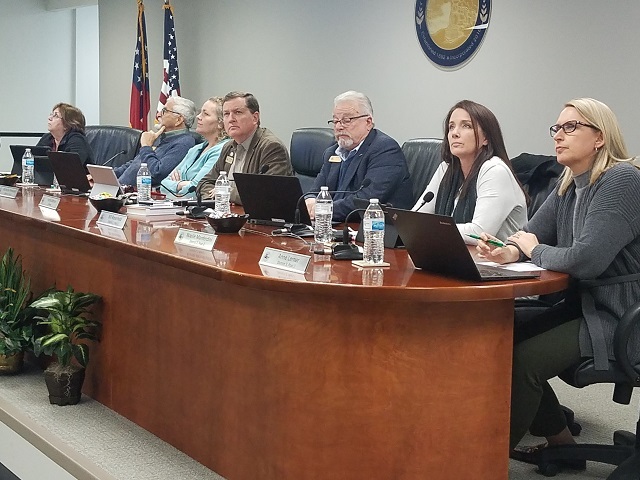 Since the city’s formation, it has had a temporary arrangement with the City of Clarkston to provide the space for municipal court hearings, Hanlin said. The current IGA with Clarkston is set to expire in May. The new agreement extends the arrangement through the end of the calendar year. Currently, the Tucker Municipal Court holds two sessions per month: Environmental Court (code citations) on the third Wednesday morning of the month and Offenses Court on the fourth Wednesday morning of the month. Environmental Court averages 33 citations per month and Offenses Court averages nine. Because each court session is limited to five hours, the judge can only hear about 30 cases each session. At this time, there are 45 pending code enforcement cases and officers are writing new citations for a May docket. The new session would be an additional Environmental Court session to be held in the afternoon of the third Wednesday and consist of hearings on established cases that have been rescheduled, allowing the morning session to hear more new cases. The annual operating budget for two court sessions a month is $47,000 with $40,000 in revenue from fines and fees. The additional monthly session will add $20,000 to the budget for the eight months of the year from April through December. The operating budget covers the costs of the municipal judge, solicitors and additional rent for the use of the space as well as the cost of a bailiff and other security needs. – Voted to enter into a contract with the firm Construction 57 in an amount not to exceed $320,000 for the purpose of filling in identified gaps in sidewalk coverage throughout Tucker. – Unanimously approved amendments to its public nuisance ordinance to allow the city to take specific measures against properties found to be housing illegal activities like prostitution and drug trafficking, as well as setting limits on the number of collection bins for donated clothing and other items that could be placed on private property. – Heard a first reading of a proposed ordinance to rezone residential property at 4062 Comanche Drive from R-75 (Residential Medium Lot) to RSM (Small Lot Residential Mix), as well as grant a concurrent variance to lot width requirements for the same property. Council members will hear a second reading of the proposed rezoning and variance at the April 8 meeting and vote at that time.